A new hub is in the works to connect the Chrysler Canada Greenway, Herb Gray Parkway Trails and the Town of LaSalle Trails. 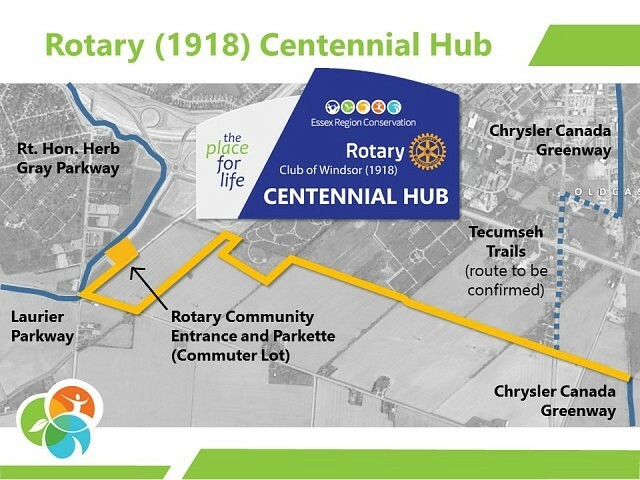 The Rotary Club of Windsor (1918) announced a $225,000 contribution to create The Rotary (1918) Centennial Hub and community entrance near Howard Avenue and Laurier Drive. Rotary (1918) will celebrate its 100th birthday next year, and is undertaking several legacy projects to mark this momentous occasion. “In searching for legacy projects that would reflect our Club’s 100 year commitment of service to this community, we are pleased to be able to partner with Essex Region Conservation to complete this amazing trail project as well as to provide a meeting place for everyone at the Rotary (1918) Centennial Hub while enjoying their time on the trails,” said Janet Kelly, Chair of the Rotary (1918) Legacy Committee. In addition to the Rotary (1918) Centennial Hub, a project will be undertaken at the Windsor Riverfront.